Meituan and Dianping, the two leading group-buying providers, often dubbed the respective Groupon and Yelp of China, have agreed to form a joint venture with equal shares valued between $15 billion and $17 billion USD, according to statements from both companies and their investors. The match-up marks the end of another O2O service war in China, once again bringing together the country’s two biggest tech powerhouses and investors, Tencent and Alibaba. The deal between Ali-backed Meituan and Tencent-backed Dianping is the second landmark merger between the tech giants this year, with their respective car-hailing apps Kuiadi Dache and Didi Dache joining forces in February. While the merger will bring together two of the largest O2O providers in the market, it won’t quite form the same monopoly as the Didi Kuaidi deal. Both Alibaba and Tencent have invested separately in other companies that are still competing successfully in the market, including Ali-backed O2O hub Koubei and Tencent-backed food and grocery delivery startup Ele.me. Tencent and Alibaba aren’t the only companies that have sought to merge their investments this year. As China’s tech services market becomes increasingly crowded, large players are looking to consolidate their stake fast, hoping to cash in on early adoption. Big-name match-ups include that of 58.com and Ganji.com, the long-time rivals in the online classified ads market, that announced their merger just two months after Didi Kuaidi. Though Dianping started off with a Yelp-like ratings and reviews service in 2003 and Meituan from group-buying in 2010, the two have evolved to become direct competitors in on-demand local services, movie and event ticketing, and hotel and attraction ticket booking. The two companies has a combined more than 80% of China’s group-buying market as of the first quarter of 2015, according to Eguan, a Chinese market research firm. Meituan estimated it had about 50% of food delivery market as of the first half of this year, and some 70% share in China’s online movie ticketing market as of April. (source in Chinese) The company has recently acquired travel search engine Kuxun from TripAdvisor, and its hotel booking revenues are also growing rapidly. 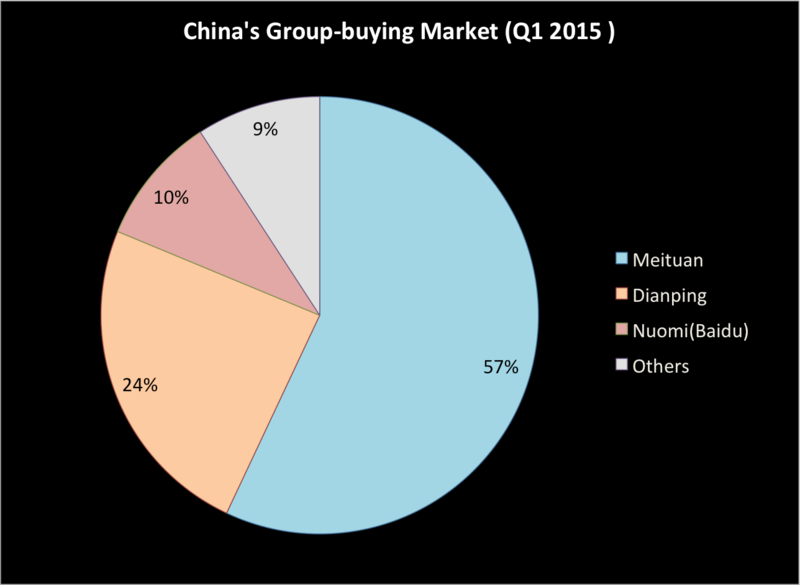 Meituan’s gross merchandise volume (GMV) was RMB47 billion (about US$7.6b), a 190% year-over-year growth, in the first half of 2015, with 95% from mobile, according to the company. Hotel booking contributed 15% of the total GMV and Maoyan (“Cat’s Eye”), contributed 13% (source in Chinese). Dianping became the only group-buying service on WeChat, the most popular messaging app in China, after the latter’s parent Tencent acquired a 20% stake in it in early 2014. Tencent and Dianping also participated in the US$350 million funding round in Ele.me in early this year (source in Chinese). After the merger the new company’s major competitors will be Baidu’s Nuomi in group-buying, movie ticketing services including Gewala, and hotel booking services including Ctrip and Qunar. 58.com, Baidu and Koubei, the new initiative by Alibaba’s finance arm Ant Financial, are determined to also get a piece from the online-to-offline service market. Both Meituan and Dianping have raised hundreds of millions dollars from Chinese tech giants and top venture capital firms. Besides Alibaba, Meituan’s investors include Sequoia Capital, who also invested in Dianping along with Tencent, Xiaomi and real estate conglomerate Wanda. The new Meituan-Dianping matchup will be co-run by the respective management teams of each company. Both CEOs will take on dual roles of co-CEO and co-Chairman of the new company. Meituan has survived thousands of Chinese group-buying sites to emerge on top, fighting of a spate of entrants that began in 2010. Despite its popularity, group-buying and online advertising for local merchants is low-margin business in China, meaning that services have to act fast to take market share. It’s common in China that hundreds of similar services will appear to follow up the hype of popular players. Apart from charging merchants relatively low commissions, venture-backed tech startups subsidize users for the sake of market share in the O2O field. But subsidies don’t necessarily cultivate sticky users. A startup without venture money to fuel growth or keep users will be shed from the arena very quickly. 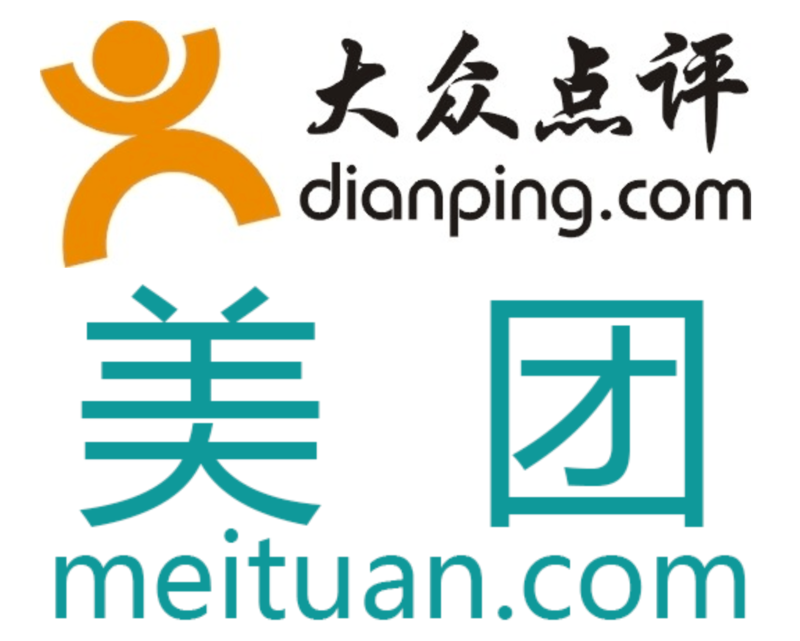 The merger between Dianping and Meituan will not only help consolidate their market share, but stem the massive spend both companies invest in subsidizing their services. After the merger Didi -Kuaidi moved even faster and more aggressively. It now offers almost all ride-sharing services existing on the market, and has become more attractive to venture capitalists raising some US$3 billion from investors in China and aboard. Didi Kuaidi believed its taxi-hailing apps, which were logging in 3 million daily rides, had 99% market share and its private car hailing service had an 80% share as of June this year, according to an e-mail from CEO Cheng Wei to the company’s investors (source in Chinese). Its only major competitor in China now is Uber which currently operates private car hailing and car pooling services, outside of Didi-Kuiadi’s core taxi-hailing service. Now Didi-Kuaidi has turned eyes to the global market. It recently made a massive investment in Lyft, Uber’s rival in the U.S.. Didi Kuaidi and Lyft will enable visitors to hail rides in each other’s country. The company has also participated in the latest funding round in Indian ride-sharing service Ola. Obviously the Didi-Kuaidi merger has inspired the Chinese internet companies who are competing fiercely for market share. The combination of 58.com and Ganji.com is estimated to have a share of over 70% in China’s classified ad market. The only other player in this space is Baixing.com. In May there were rumors that Youku-Tudou and iQiyi, major players in China’s online video space, were also in talks of a merger. Youku-Tudou was the result of the combination of Youku and Tudou, the then largest online video sites. Commenting on the rumors, Victor Koo, CEO of Youku-Tudou, said he believed video industry consolidation would continue (source in Chinese). Gong Yu, CEO of the Baidu-backed iQiyi, later said that they would still push for an IPO regardless (source in Chinese).